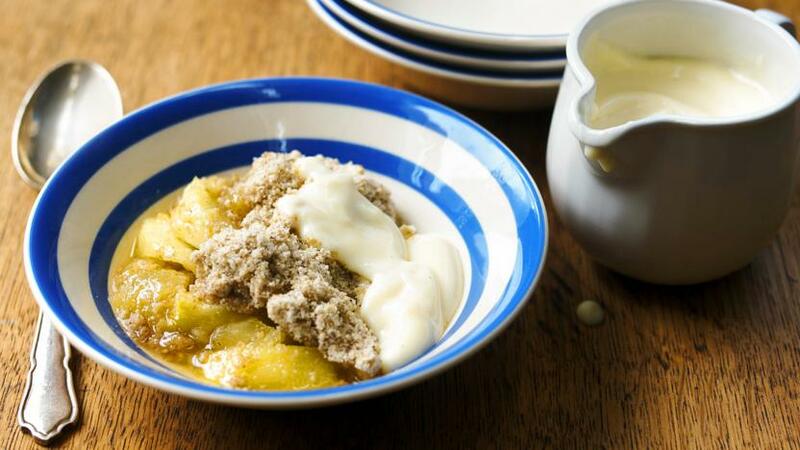 Toffee adds a decadent twist to a classic apple crumble. Serve with lashings of custard. For the custard, place the egg yolks and sugar into a bowl. Place the milk and vanilla seeds into a saucepan and bring to the boil, then pour into the egg and sugar mixture. Whisk until well-combined. Return the custard mixture to the saucepan and warm over a low heat until it thickens enough to coat the back of a spoon. To serve, divide the crumble between 4-6 serving plates and place a dollop of custard on each.